Here is a beautiful elevation of the Cathedral of Pavia drawn in the early 1300's by Opicinus. It is from the Metropolitan Museum of Art 2009 exhibition - Pen & Parchment: Drawing in the Middle Ages (http://blog.metmuseum.org/penandparchment/). 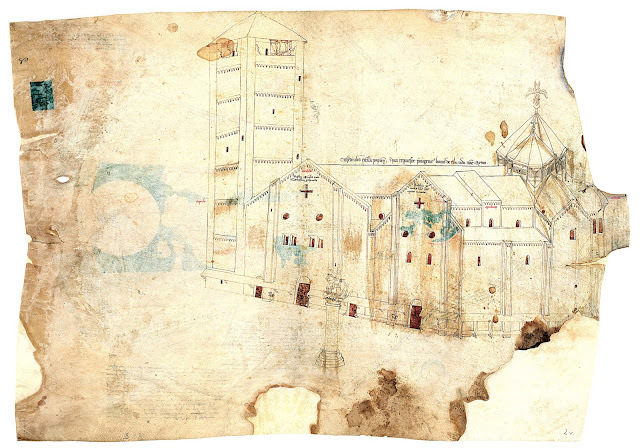 "The now-destroyed double cathedral of Pavia, Opicinus's hometown, is the subject of this drawing. The two churches and the campanile are all sketched in three-quarter view, allowing the maximum representation of the facades, naves, transepts and towers. Though he was not trained as an architect, his experiences as a manuscript illuminator and cartographer would have taught him many of many of the geometric strategies necessary to create such a view of the buildings. The only work in his portfolio that does not contain a diagram, this drawing attests to his skills as draftsman and his interest in local landmarks and sites."